The ASOCIO Smart City Summit 2018, themed “Creating Smarter City and Securer City by Digital Solutions,” kicked off in Hanoi on September 18. The two-day event, jointly held by the Hanoi People’s Committee, the Asian-Oceanian Computing Industry Organization (ASOCIO) and the Vietnam Software and IT Services (Vinasa), brings together over 600 local delegates who are leaders of central-level offices, Hanoi, and other localities keen on building smart cities, associations, organizations and IT-related enterprises, together with nearly 70 foreign delegates from 20 nations and economies around the world. Delegates shared views on issues related to smart urban building and discussed measures to speed up the process in Vietnam and other countries via the application of new technologies. Many stressed the cooperation in smart city building and the importance of paying attention to sustainable development goals related to human and the environment. They are expected to take part in six seminars on digital government and strategies to build smart cities, and smarter cities with less cash transactions; along with sections on infrastructure, platform – principles for smart city, data driven city – data analysis & urban planning and smart industries. Vietnam is said to be a nation with the fastest urbanization rate in the region and the world. According to a report by the Ministry of Construction, as of late 2017, Vietnam had 813 urban areas, with the urbanization rate of 37.5 percent. Its capital, Hanoi, is considered as a “super urban area” in terms of both area and The rapid urbanization and population increase have resulted in various problems relating to planning, traffic jam, security, health care, education, energy, housing development and pollution. Given this, building a sustainable and smart city that ensures convenience, safety and hospitality for local residents is urgent for the city. 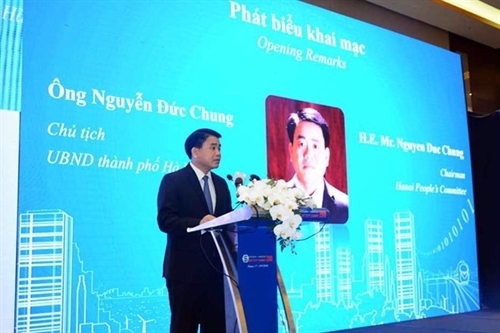 Speaking at the event, Chairman of the municipal People’s Committee Nguyen Duc Chung said that Hanoi wants to build a smart city which is convenient, safe and friendly to locals, using main technologies of the fourth Industrial Revolution. To date, the city has issued various plans with the priority given to building a smart monitoring center, a smart transport system and a smart tourism system. In early August 2018, Prime Minister Nguyen Xuan Phuc approved a project to develop sustainable and smart cities. With the goal of developing sustainable and smart cities, Vietnam hopes to boost green growth and sustainable development, bringing into full play its potential and advantages, and increase the efficiency of the use of its resources. The country also wants to improve locals’ living standards, increase the economy’s competitiveness and step up international integration. Until 2020, the project will work to build a legal basis for sustainable and smart city development, issue policies and mechanisms applied to the regions subject to pilot implementation, build and pilot the application of the ICT framework on smart city development, develop the GIS-based urban space data infrastructure, and build a national city database. By 2025, the first phase of the pilot implementation of smart city development will be carried out, focusing on building and finalizing legal corridors and regulations, applying the ICT framework to smart city development in Vietnam, announcing national standards prioritized for building smart cities and developing the urban space data infrastructure.